Nueva Cocina Foods -- the nation’s first line of all-natural, easy-to-make and gluten-free Latin soups, seasonings and rice mixes -- recognizes Celiac Awareness month with recipes and promotions. What is one of the most common chronic health disorders in western countries and affects approximately 3 million Americans? It’s Celiac Disease, also known as gluten intolerance, a genetic disorder with symptoms from mild weakness and bone pain, to chronic diarrhea, abdominal bloating, and progressive weight loss. Those affected suffer these symptoms when they eat specific food-grain antigens that are found in wheat, rye, and barley; and the only treatment for celiac disease is a lifelong gluten-free diet. Since May is Celiac Awareness month, Nueva Cocina– the nation’s first line of all-natural and easy-to-make Latin soups, seasonings and rice mixes – wants to take consumers on a culinary adventure by showing them that eating gluten-free due to Celiac Disease or other food allergies, can be delicious. One of the most common misconceptions about gluten-free foods is that they taste bad or bland and have a strange consistency. Nueva Cocina founders Celeste De Armas (who is gluten sensitive) and Corina Mascaro set out change this perception. “From the very beginning, our intention was to create a line of products that we would want to eat ourselves, and feel good about serving to our family and friends. We knew that there was nothing available in the Latin food category that was 100% natural, met the gluten-free dietary needs of millions of people, and at the same time, tasted amazing.” Today, 16 out of 18 Nueva Cocina products are gluten-free. 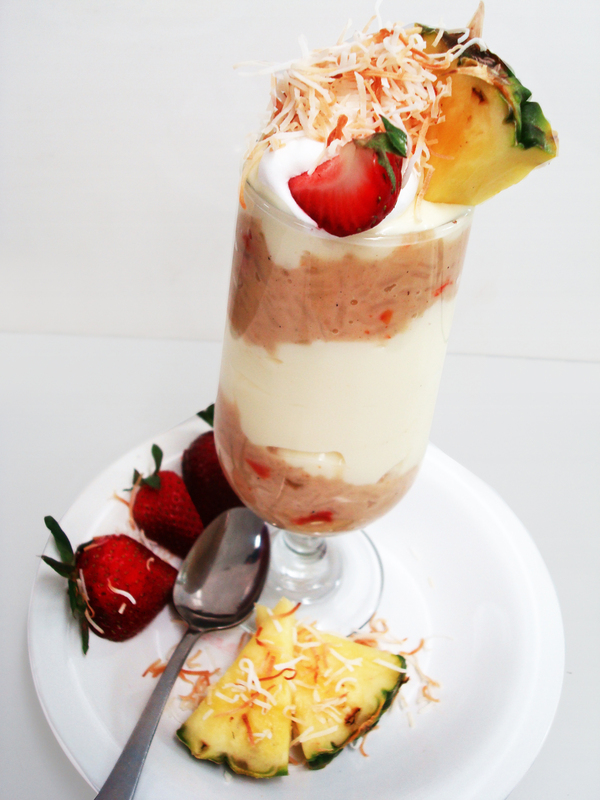 Throughout May, Nueva Cocina will feature recipes on the company website and Facebook and Twitter pages that will tantalize taste buds and take eating gluten free from drab to ‘delicioso.’ The recipe below for Coconut Raisin Rice Parfait is a sweet start to a tasty trip into gluten-free cooking. Nueva Cocina is also putting their money where their mouth is too by offering a 20% discount off of their Gluten-free Variety Pack, which features two each of their gluten-free rice mixes, soups and seasonings. Click here http://www.nuevacocina.com/store/2386/Gluten-Free-Pack.aspx and enter in the code NOGLUTEN when purchasing. Follow the directions on the Nueva Cocina box to cook the Coconut Raisin Rice. Once cooked, add 1 cup of cream of coconut, 1 cup of the unsweeted coconut milk and 1 tablespoon of butter. Cook on low heat until liquid is absorbed and rice has a thick and creamy consistency, approximately 20 minutes. Remove from heat and refrigerate covered for at least an hour. When ready to serve, spoon a layer of pudding into a wine glass, then add a layer of the rice mixture. Continue to build your layers and top it off with whipped cream. Garnish with toasted coconut and/or fruit of your choice. When Celeste De Armas and Corina Mascaro met at college they discovered several things they had in common. Both women were born in Cuba, and both missed the delicious home cooked Latin meals they grew-up on. They also shared a concern about the “freshman 15” weight gain, so Celeste and Corina started paying more attention to what they were eating and changed their diets to include healthier fare. Little did they know that more than twenty years later, they would launch Nueva Cocina Foods. Nueva Cocina (http://www.nuevacocina.com) is the new way to cook Latin™. This all-natural product line contains the premium ingredients needed in just one box to create flavorful recipes from Latin America and the Caribbean. With an assortment of 18 different soups, seasonings and rice mixes, the brand is a favorite of people who don’t eat gluten (16 of the 18 products are gluten-free) and of vegetarians (14 of the 18 products are meatless). With Nueva Cocina, everyone can cook or simply enjoy Latin food.